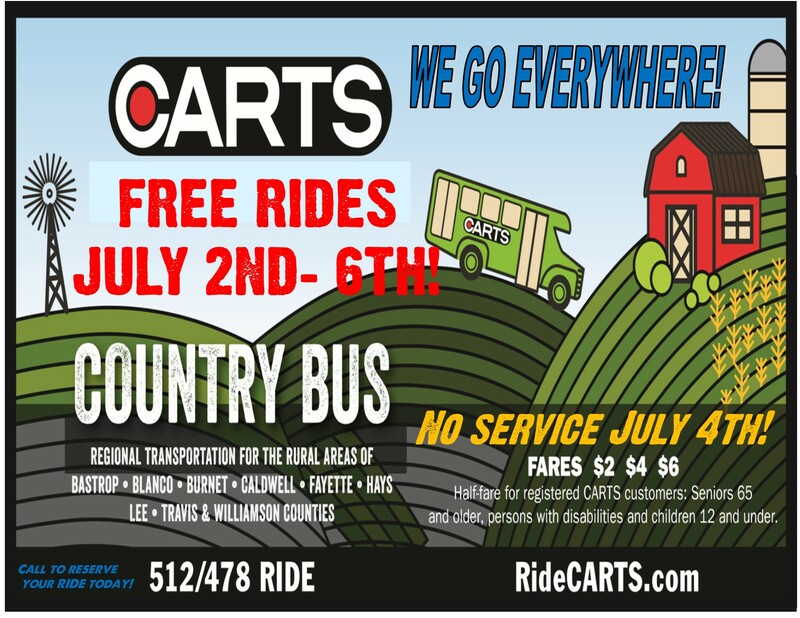 CARTS Offers FREE RIDES July 2nd through July 6th on Country Bus service! The CARTS Country Bus is regional community-based transportation for the rural areas of Bastrop, Blanco, Burnet, Caldwell, Hays, Fayette, Lee, Travis and Williamson Counties. The Country Bus is a flexible service that provides rides locally and to nearby destinations but requires a ride reservation be made in advance. Ideal for seniors, disabled individuals or others requiring special assistance, it is also available to everyone. This community transit service provides curb-to-curb transportation throughout the CARTS district and connects to the regional intercity bus network for extending access beyond local destinations, including Capital Metro and Greyhound. Enjoy the convenience of having a CARTS bus pick you up at your home, take you to your destination, and then back home again. To schedule your ride call 1-512-478-RIDE (7433). Rides are scheduled Monday thru Friday, from 7:00am to 4:00pm. 24-hours advance notice recommended. Local vehicles serve neighboring towns, so ride times may vary. We'll set up a time for pickup within our time slots of general availability. On your first call we will request information to enter into your customer profile, and after that we will know you when you call. It's that simple. The CARTS Country Bus service can help you or someone you know who needs a ride for shopping, city business, medical appointments, work, nutrition visits or any other purpose.